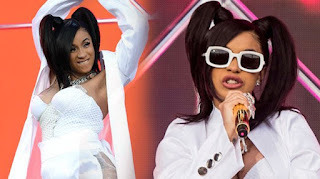 Home » Cardi B » Cardi B at Coachella » Cardi B Coachella » Cardi B Coachella 2018 » Cardi B Performance at Coachella » Coachella 2018 » Gossip » What Time Does Cardi B Perform » Pregnant Big, Cardi B Staying Lively in Coachella 2018! Still Get the Twerking! Pregnant Big, Cardi B Staying Lively in Coachella 2018! Still Get the Twerking! One of the largest and most historic music festivals in the United States, Coachella, was again held. The concert featured a variety of top musicians from different genres. Dozens of musicians fill the event held for days from 13 April to 22 April 2018 this. One of the fills of this event is the figure of a rising female rapper Cardi B. Appearance Cardi B in Coachella this year could be said to be the spotlight for many public. Cardi B performs in Coachella in a big pregnancy! More impressive again, the appearance also became the debut debut of the lover Offset in one of the largest festival in the United States. With this performance, Cardi B managed to brave himself more dare to take risks than Beyonce. Keep in mind, Beyonce did not become a gig at Coachella in 2017 because his figure when it was containing his third child with Jay-Z. Because of these pregnant factors, Beyonce who previously entered the headline last year was not a gig. Nevertheless, Beyonce herself avenged his fans' disappointment at Coachella last year with a phenomenal buzz with his former colleagues at Destiny's Child at this year's title. The lover of rap rap member Migos is tapil wearing an all-white outfit with a bulge that is so large in the stomach. Although it looks really pregnant. Cardi B did not relax its appearance at least when collaborating with many artists on stage. Even he had to do twerking action on stage. In this performance, Cardi B performs in collaboration with several famous names such as 21 Savage, YG, G-Eazy, Chance the Rapper, and Kehlani. Apparently this one pregnant woman is really different! 0 Response to "Pregnant Big, Cardi B Staying Lively in Coachella 2018! Still Get the Twerking!"